A Royal Navy Sea Harrier taking off from the ski-jump on the deck of HMS Invincible in 1990. In aviation, a ski-jump is an upward-curved ramp that allows aircraft to take off from a runway that is shorter than the aircraft's required takeoff roll. By forcing the aircraft upwards, lift-off can be achieved at a lower airspeed than that required for sustained flight, while allowing the aircraft to accelerate to such speed in the air rather than on the runway. Ski-jumps are commonly used to launch airplanes from aircraft carriers that lack catapults. The small Spanish-built Thai carrier HTMS Chakri Naruebet with ski-jump deck in the South China Sea in 2001. A fixed-wing aircraft must build up forward speed during a lengthy takeoff roll. As the forward velocity increases, the wings produce greater amounts of lift. At a high enough speed, the lift force will exceed the weight of the aircraft, and the aircraft will become capable of sustained flight. Since the aircraft must reach flight speed using only its own engines for power, a long runway is required so that the aircraft can build up speed. On an aircraft carrier, the flight deck is so short that most aircraft cannot reach flight speed before reaching the end of the deck. Since lift is less than gravity, the aircraft will lose altitude after the wheels leave the flight deck and possibly fall into the sea. A ski-jump ramp at the end of the flight deck redirects the aircraft to a slight upward angle, converting part of the aircraft's forward motion into a positive rate of climb. Since the aircraft is still traveling at an inadequate speed to generate enough lift, its climb rate will start to drop as soon as it leaves the flight deck. However, the ski-jump launch has given the aircraft additional time to continue accelerating. By the time its upward velocity has decayed to zero, the aircraft will be going fast enough for its wings to produce enough lift. At this point, the aircraft will be in stable flight, having launched from the carrier without ever dipping below the height of the flight deck. Many modern aircraft carriers lack catapults, so heavy aircraft must take off using their own engines. Ski-jumps make it possible for heavier aircraft to take off than a horizontal deck allows. However, ski-jump launches cannot match the payloads made possible by high-speed catapult launches. A Fairey Barracuda takes off from the temporary ski-jump on HMS Furious in 1944. The wooden support structure of the ski jump is clearly visible. Early aircraft carriers could launch aircraft simply by turning into the wind and adding the ship's own speed to the airspeed experienced by the aircraft. During World War II, carrier aircraft became so heavy that assisted take-off became desirable. Deck catapults were used to accelerate aircraft to takeoff speed, especially when launching heavy aircraft or when it was inconvenient to change course. An early use of the ski-jump occurred in 1944, when the British aircraft carrier HMS Furious launched a strike against the German battleship Tirpitz. 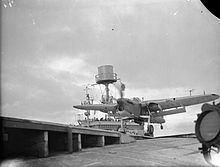 A ski-jump ramp was temporarily installed on the end of the flight deck to help the bomb-laden Fairey Barracudas take off. As carrier aircraft kept getting heavier after World War II, it was feared that even a catapult would one day not be enough. An NACA study from 1952 proposed the use of a ski-jump after the aircraft catapult to assist aircraft in taking off. In his 1973 M.Phil. thesis, Lt. Cdr. D.R. Taylor of Britain's Royal Navy proposed using a ski-jump to help the Harrier Jump Jet take off. Initial testing with various ramp angles was carried out at RAE Bedford, using the two-seat Harrier demonstrator G-VTOL. Tests showed that performance increased with ski-jump angle, but the minimum angle was selected to avoid putting excessive stress on the aircraft's undercarriage. The Royal Navy subsequently built its Invincible-class aircraft carriers with ski-jumps to support Harrier operations. After the success of the Harrier, the ski-jump became a proven method for launching aircraft from ships without the complexity and expense of a catapult. Ski-jumps were added not only to aircraft carriers, but also to amphibious assault ships and landing helicopter docks. After Brazil retired the aircraft carrier São Paulo in 2017, only the United States and France still operated aircraft carriers with catapults. On Short Take-Off But Arrested Recovery aircraft carriers (STOBAR), conventional aircraft are launched using a ski-jump. The pilot increases the aircraft's thrust by switching on the afterburners, while holding the plane by braking. Two panels are raised from the deck of the aircraft carrier in front of the aircraft's main landing gear, ensuring the plane remains motionless. Upon command, the pilot releases the brake; the panels from the deck drop back into their slots; and the aircraft rapidly taxis forward under maximum thrust. Rolling over the ski ramp launches the plane both upward and forward. A MiG-29 launching over the ski-jump ramp on a Kuznetsov-class aircraft carrier can take off at a speed of about 70 kn (81 mph; 130 km/h) instead of the usual 140 kn (160 mph; 260 km/h) (depending on many factors such as gross weight). With the exception of the United States and France, every navy in the world that currently operates naval fixed-wing aircraft from carriers uses ski-jump ramps. Short Take-Off, Vertical Landing aircraft (STOVL) make a conventional rolling takeoff, with the jet exhausts set to provide maximum forward thrust. As the plane nears the ski-jump ramp, the jet exhausts are rotated to provide lift as well as forward thrust. Such takeoffs allow a larger takeoff weight than an unassisted horizontal launch, because the ski-jump ramp provides a vertical impetus when most needed, right at takeoff at the slowest takeoff speed. Ski-jump ramp takeoffs are considered safer than takeoffs over a flat-top carrier. When a Harrier launches from an American LHA, it would finish its takeoff roll and begin flight at 60 ft (18 m) above the water. It might not have a positive rate of climb, especially if the ship had pitched nose down during the takeoff roll. Using a ski-jump ramp, a Harrier will certainly launch with a positive rate of climb, and its momentum will carry it to 150 to 200 ft (46 to 61 m) above the water. For example, an AV-8B Harrier with a gross weight of 29,000 lb (13,000 kg) on a 59 °F (15 °C) day and a 35 kn (40 mph; 65 km/h) wind over the deck would require 400 ft (120 m) to take off using the 12° ski-jump ramp on the Spanish aircraft carrier Príncipe de Asturias. The same plane would use the entire 750 ft (230 m) length of the Tarawa class's flat flight deck. U.S. Marine aviators who experimented with takeoffs from the Spanish aircraft carrier found the improvement to be "nothing short of amazing." The United States is the only country which operates STOVL aircraft from carriers without a ski-jump ramp. The U.S. Air Force has examined the use of ski-jumps on land to enable short-field takeoffs. This was seen as "a possible solution to the runway denial problem in Europe" during the Cold War. When a ski-jump with a 9 degree exit angle is used, the takeoff roll of an F/A-18 Hornet can be cut in half. Wikimedia Commons has media related to Aircraft carrier ramps. ^ a b Fozard, John (4 December 1976). "'Ski Jump' Harrier". Flight International. Vol. 110 no. 3534. pp. 1630–1635. Retrieved 29 April 2017. ^ a b Reed III, Wilmer H. (1952-11-05). "An Analysis of the Effect of a Curved Ramp on the Take-off Performance of Catapult-Launched Airplanes" (PDF). National Advisory Committee on Aeronautics. ^ "The Problem with Ski-Jump Aircraft Carriers". Strike Fighter Consulting Inc. October 4, 2013. ^ Green, Michael. Aircraft Carriers of the United States Navy. Pen and Sword. p. 57. ISBN 9781473854680. ^ Brown, J. D. (2009). Carrier operations in World War II. Seaforth Publishing. p. 25. ISBN 9781848320420. ^ Stille, Mark (2012). US Navy Aircraft Carriers 1922-45: Prewar classes. Bloomsbury Publishing. p. 5. ISBN 9781780968094. ^ "Ski-jump Harrier" (PDF). 20 November 1976. p. 1468. ^ Field, Hugh (19 November 1977). "Harrier Rampant". Flight International. p. 1487. Retrieved 29 April 2017. ^ Hobbs, David (2015). The British Carrier Strike Fleet: After 1945. Seaforth Publishing. pp. 469–472. ISBN 9781612519999. ^ Gordon, Yefim (2006). Sukhoi Su-27 Flanker - WarbirdTech Vol 42. Specialty Press. p. 69. ISBN 9781580071963. ^ Hobbs, David (2015). The British Carrier Strike Fleet: After 1945. Naval Institute Press. p. 470. ISBN 9781612519999. ^ Turner, Elijah W. (May 1991). "Aircraft Operations from Runways with Inclined Ramps (Ski-jump)" (PDF). This page was last edited on 14 December 2018, at 02:37 (UTC).